TC Marcia has developed into a Cat 5 (the highest possible) and is headed directly for the city of Rockhampton in Queensland. The areas affected are heavily populated, and including Yeppoon, Gladstone, Bundaberg, Hervey Bay, Gympie and further down, Brisbane itself will feel the effects. Again, the ABC is reporting the latest, including wind gusts of up to 300 km/hour. In St Lawrence, hundreds of locals were asked to evacuate by police last night, and urgent evacuations were ordered in Yeppoon early this morning. Queensland Police said the emergency cyclone shelter at the St Lawrence bowls club had been shut down as it was not strong enough to handle the system. Bureau of Meteorology (BoM) senior forecaster Sam Campbell said the monster storm was not expected to weaken quickly, and would likely remain at least a category three until this evening, and possibly into Saturday. ...Bureau of Meteorology regional director Rob Webb said the cyclone would dump between 200 millimetres and 300 millimetres of rain. Abnormally high tides will be experienced today with water levels expected to rise above the highest tide of the year on the high tide. Stay safe everyone. Our thoughts are with you. I was hoping to ask a question about these storms - does anyone know if there is a table of total category hits land-falling per day/week, over time? For example, over the last 24 hours theres been a category 4 and a category 5 crossing land - a "category total" of 9. How has this index changed over time? Yes, I'd be interested, too. 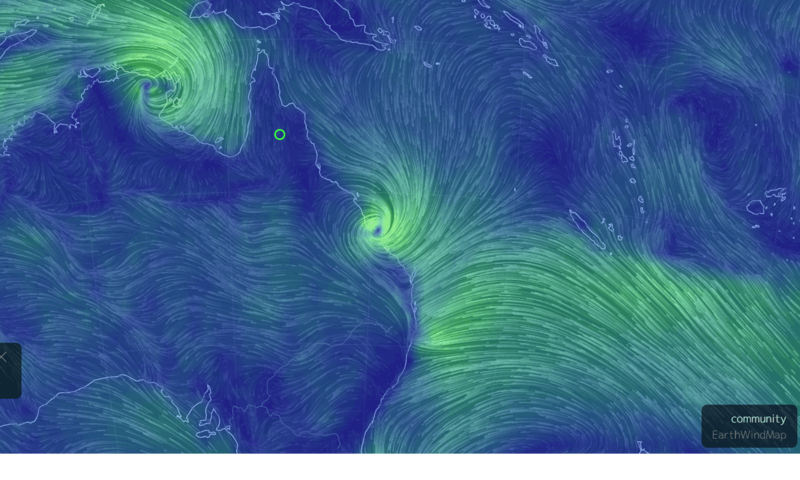 I'm guessing that it's unusual for two cyclones to hit land in Australia within the same few hours. They are coming from quite different directions, too. I'm also wondering what the impact will be in other parts of the country. 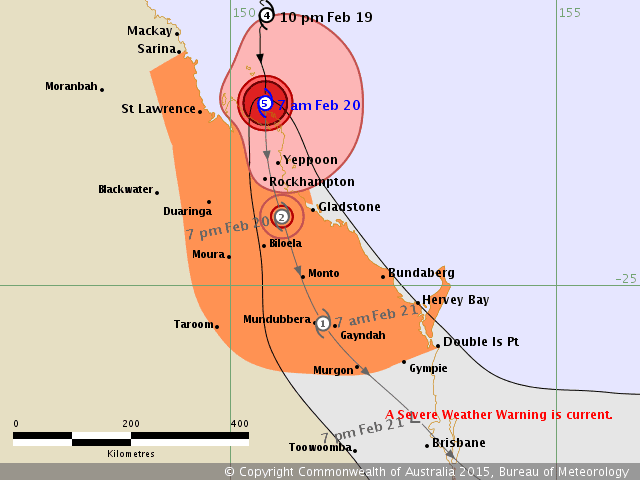 Where I live in SE Australia, in the past we've felt effects of cyclones from WA and from Qld. These two happening so close together will probably bring some interesting weather across the country. Bernard, there's not enough data for your suggested metric to work - there simply aren't enough landfalling cyclones in the Australian (or even the SH) season to make it meaningful, especially over time. That said, it is extremely unusual to have two landfalling cyclones at the same time. And the more so that they were at such intensity. 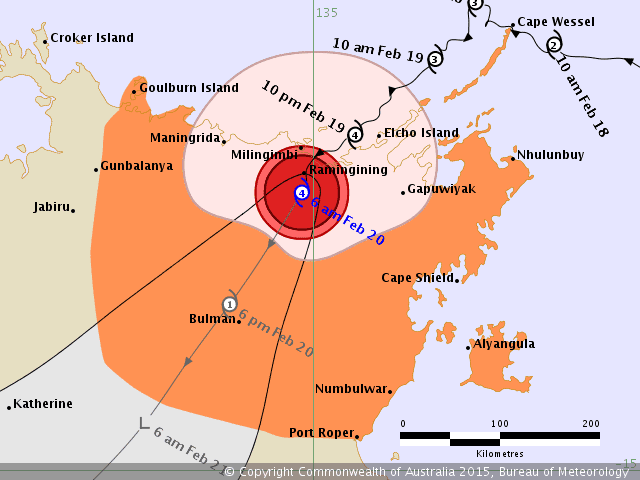 Cyclone intensity is intimately tied to sea conditions, and they typically lose intensity in the last few hours before landfall due to their behaviour over shallow water. When you hear about this or that storm having been a Cat-5 (the definition of which varies basin-by-basin, incidentally) that is usually its peak intensity over open ocean - Katrina, for example, diminished from a Cat-5 to a Cat-3 in the last six hours before making landfall (else New Orleans would have got it even worse...). This weakening is probably more likely for Queensland Cyclones due to the screening of the Great Barrier Reef, although it depends on the exact course it follows. Not many storms are still at Cat-4 or 5 at landfall. To have two at once is exceptional. I think I have a list somewhere, I'll see if I can find any other instances. Here's a list from the BOM of cyclones back to 1970. Looking through it, there are several instances of more than one cyclone being active at the same time, but I haven't opened them all to see if they made landfall at the same time. On edit from above, I do see Kirsty and Ethel in March 1996 seem to have come ashore at the same time, though one (Ethel) landed, went to sea and then looped back again, making landfall 4 times as cyclone strength. 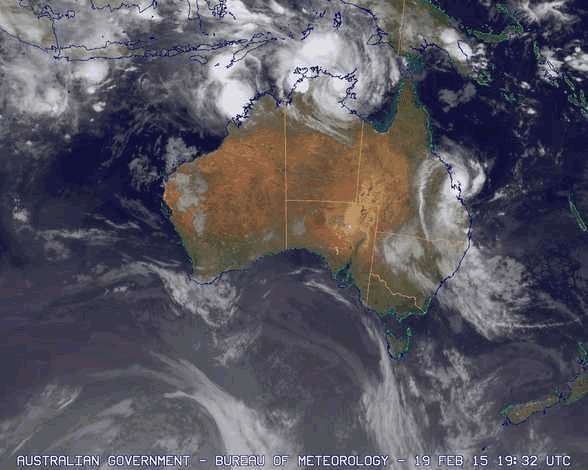 Cyclone Marcia: how storm took forecasters by surprise. I'm not surprised to read that it took the forecasters by surprise. I read about it a few days ago and there was no fuss at all. Well apart from the normal low grade cyclone / tropical storm warning. I am sure there will be speculation soon about whether the cyclones were influenced by global warming or not. I suspect the result will be inconclusive. I have seen some data which suggests the ocean along the east coast of Australia is unusually warm - you could argue that this has enhanced the cyclones. There is some concern about a coral bleaching event - I guess we will find out over the next several months. Harry, I was considering this subject this earlier this evening and I'd go so far as to say that Cyclone Marcia is pretty much completely a result of global warming. The rapidity of its escalation to category 5, apparently resulting from the unusually high ocean temperature, caught even the Bureau of Meteorology off-guard - only 24 hours earlier it was a category 1 and heading to likely fizzle on its trajectory toward the coast. Had there not been the extra heat in the ocean the depression that became Marcia would likely have crossed the coast with barely a comment from anyone. Warm ocean temperatures are necessary but not sufficient for rapid deepening. You also need those temperatures to penetrate deep enough that the storms churning of the ocean does not bring up cold water - which is still consistent with a warming regime. But you also need low windshear and anticyclonic circulation above the storm (in the upper troposphere). I don't know much about what drives those, but you would need to link them to GW to say that was "pretty much completely the result of global warming". GW certainly helped. Intensifying from Cat-1 to Cat-4 in 12 hours isn't the fastest and deepest ever recorded, but it's is quick. In unrelated and unsurprising news, Jennifer Marohasy is talking it down, BOM don't know what they're talking about, blah blah blah. She seems to think that central pressure is what defines the category of a cyclone, and is claiming the the pressure recorded at Rockhampton means it only "qualifies" as a Cat-1. Cart before the horse? Cat-1's have typical pressures in a range including the 975 at Rocky. Except that central pressure is not the basis for determining the Cat, windspeed is. And except that reading was not perfectly in the eye (close, but not quite) and was some hours after landfall anyway. TBH, her grasp of the nuance appears slightly less that this graphic: http://twitter.com/alicia_j_burke/status/568368097154871297/photo/1 - she's not just ignorant, I'd say she's pathological. Since cyclones rarely pass directly over met stations (although Yasi did while flattening the Willis Island instruments on her way through in 2011), peak winds at the core have to be determined by satellite imagery. That data said borderline Cat-4/Cat-5, with 10-minute sustained winds of 205 km/h. "Warm ocean temperatures are necessary but not sufficient for rapid deepening. You also need those temperatures to penetrate deep enough that the storms churning of the ocean does not bring up cold water - which is still consistent with a warming regime." Exactly Frank, which is why I would suggest that human-caused global warming is pretty much responsible for the significance of the manifestation of Marcia. Of course, I should probably elaborate that "pretty much responsible" means "to the extent (as I once told KarenMackSunspot) that the extra warmth in the Pacific is a consequence of heat retention resulting from increased 'greenhouse' gases" but as I said in my earlier post, absent AGW the low that would otherwise have been Marica would probably not have rated a mention outside of a state weather report. AFAIK it isn't possible to identify any trends in TC strength, given the difficulties in attributing intensity on a case by case basis over the last 40 years, and due to natural climate variability. Even forecasting the future in a warmer world is fraught with difficulty. How will the ocean circulation vary, how will El Nino / La Nina frequency be modulated. Estimating the change in upper level wind strength will be crucial - how will wind shear change? Probably the only aspect that is clearcut is that ocean temperatures will warm in depth. This (probably) supports the notion that, whether there will be less or more TCs in a warmer world, their maximum potential intensity (MPI) will be higher. I posted the below on one of the "other" web sites - where there is some questioning whether Marcia actually was a Cat 5 system, It certainly appears to have been very close to being a Cat 5 as it approached the cost - but it also weakened rapidly over land ..
Additionally the system was moving south at 15 km/h as it passed to the east - so Middle Percy island was on the weaker side. If you account for translation speed, winds on the stronger side would have been 30km/h stronger, ie 238 km/h. If you look at the ADT estimates for Marcia - the one minute winds were estimated at 122 knots. Using the over ocean 1 minute to 3 second gust conversion (1.11) - this gives 263 km/h in the eye wall. Given that Middle Percy missed the eyewall - this is excellent agreement. Once the system crosses land the water to land the 1 minute to 3 second gust conversion is used (1,23) - this gives 293 km/h. Ergo the wind estimates were very good. Given the absolute midget nature of the system it is not surprising that the wind structure collapsed rapidly - this is perhaps why Rockhampton experience much lighter winds than you might otherwise expect. A similar feature was noted with Tracy."